CW4 Moore was born in Burley, Idaho in December 1971. He entered the Army from Dallas, Texas in February 2000. 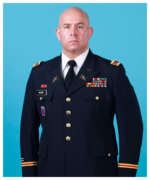 CW4 Moore serves as the Senior System Integrator in the Operations Section of the 49th Missile Defense Battalion. In this role, he interfaces with partner organizations across Fort Greely and throughout the Ground-based Missile Defense (GMD) enterprise regarding maintenance, training, and operations. CW4 Moore has served across the Brigade and Battalion in a variety of assignments for more than a decade. In a year where the Battalion saw over 40% turnover across its crews, Chief Moore’s personal efforts resulted in consistent 24-7 manning by qualified and certified personnel and a 20% increase in Operational Readiness Evaluation scores across the Battalion when compared to the previous five years. CW4 Moore was also one of three personnel across the Brigade charged with training crews on significant updates to NORTHCOM tactics in 2018. After the fielding of GMD system upgrade 7A, CW4 Moore worked with material developers to identify unforecasted off-nominal behaviors in the system, quickly developed alternative processes, and was a key stakeholder in the rapid corrective action implementation, resulting in optimal GMD performance in support of spiral development goals. CW4 Moore is also the 49th Battalion’s coordination officer in support of the development of GMD Missile Field 4 at Fort Greely. He continues to advocate for the Army with the Missile Defense Agency, material developers, and security leads to ensure full mission readiness while significant focus is placed on rapidly developing additional capability for the GMD system in defense of the Nation. CW4 Moore’s Awards and decorations include the Meritorious Service Medal (2nd Award), Army Commendation Medal (4th award), Army Achievement Medal (5th award), Meritorious Unit Commendation, Army Good Conduct Medal, National Defense Service Medal, Iraq Campaign Medal (x3), Global War on Terrorism Service Medal, and the Overseas Service Ribbon (numeral two). Chief Moore has been married 15 years to the former Rebecca Nassali of Kampala, Uganda and they have one daughter, Zoe.